The sun is out (still pretty cloudy though...), the arrivals hall at McCarren International Airport is filled with a buzz of excitement and there's a lanyard hanging round our neck. It can mean only one thing... it's time for CES 2019! CES 2019 is the world's biggest tech show, and we're reporting live from Las Vegas for the next week to bring you all the latest news, launches, insight, analysis and exciting developments in the world of technology. We'll be getting hands on with all the hottest gear, speaking to the people who matter from the biggest companies around, and unearthing the weirdest, wackiest and potentially game-changing under-the-radar tech the show's vast halls have to offer. 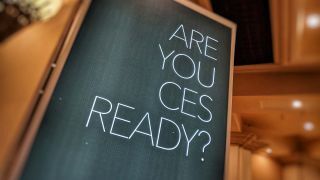 CES 2019 officially runs from January 8 - January 12, but most of the major press conferences will take place on January 6 and 7, which means we've got a full week of exciting tech announcements. We're expecting to see 8K TVs, the next generation of computing, flexible phones, exciting new car tech and lots more including wearables, drones and smart speakers. You can keep up to date with all the latest news and hands on reviews with our CES 2019 hub, which will be rounding up all the hottest tech at the show.